March 26 is a public holiday in the Republic of Mali known as Martyrs' Day or Democracy Day. It commemorates the 1991 coup that marked the beginning of transition to multiparty democracy in the country. 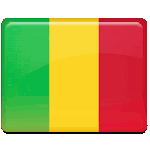 In 1960, Mali proclaimed its independence. Modibo Keïta became the country's first president. In 1968, Keïta was ousted in a bloodless military coup organized by a group of young officers. Moussa Traoré became the new president of Mali. In 1974, a new constitution was adopted, officially creating a one-party state. In 1975, Traoré established a new political party, Democratic Union of the Malian People, in order to provide the military junta with political legitimacy. It was the only legal party in the country. Traoré's regime brutally suppressed all anti-government demonstrations and coup attempts. However, around 1990, opposition movement began to gain strength. In March 1991, students and government workers started an anti-government riot. On March 26, 1991, Traoré was arrested by a group of military officers, led by Amadou Toumani Touré. This event marked the beginning of democratic reforms in the country. Its anniversary was declared a public holiday. On this day, Malians celebrate democracy and mourn for those who gave their lives, struggling for democracy.